"2014 started to go wrong when Jorge broke his collarbone the previous year. To recover so quickly was almost unhuman" - Wilco Zeelenberg. Crash.net sat down for a wide-ranging interview with Wilco Zeelenberg, Jorge Lorenzo's Movistar Yamaha team manager, at the end of the second Sepang MotoGP test. The Dutchman, an eleven time 250cc podium finisher and winner of the 1990 West German GP, has looked after Lorenzo's side of the garage since 2010. 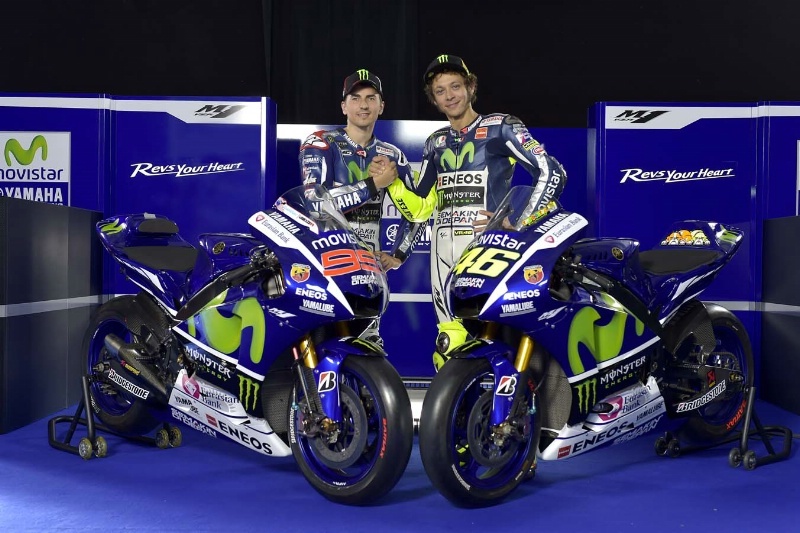 Together they have celebrated 28 victories and two world championships and, after a disastrous start to 2014, Lorenzo retaliated to score the most points of any rider in the second half of the season. Wilco, what's your verdict after these two tests at Sepang? Well of course after our 2014 season we were interested to see how Jorge got back in his motivation, because the beginning of last season was bad. OK the second half of the season was a lot better. You have, a little bit, to face the facts. We talked about it a couple of times. I went to his house in Barcelona and we trained together. If you look back at what happened last year, basically it started to go wrong when he broke his collarbone the previous year . Because that took so much energy out of his body. To recover so quickly was almost unhuman. Everybody knows this. But he needed time to rest from that period. So it's easy to say he was not fit enough. 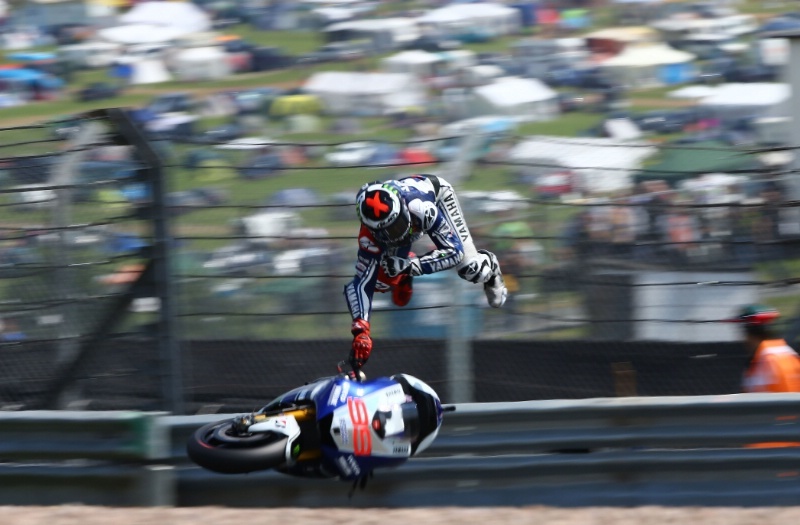 Having made a miraculous comeback from a fractured collarbone in practice to finish 5th in the 2013 Assen race, Lorenzo needed further surgery after re-damaging the collarbone in this accident next time in Germany (Pic: Gold & Goose). Exactly. So the big picture is that, yes, Jorge was not fit enough [at the start of last season] but you also have to realise why. And he has to realise why. Because it is easy to say 'I didn't train enough'. When I look back, from the moment he got injured [at Assen and then again at Sachsenring 2013] and the way he exercised during the summer break, when everyone else went on holiday. He was working out after the operations and then for the whole 2013 season. You know what happened at the last round: Jorge beat everybody and missed out on the championship by this much [4 points to Marc Marquez] but he felt like a magician. At Valencia he was so proud of that race. But that season took a lot of energy out of him. The bottom line is that he needed time to recover and then there was a combination of other factors before 2014. The first was that he made a decision in winter time, that was wrong, and changed to another trainer. So he was already a bit late starting training after the [winter] operations, then with the new trainer he didn't have the best link. So he changed to trainer number three and has stayed with him. Then in that period from Sepang 1 to Sepang 2 last year, we also got the Bridgestone tyre story. Which basically took away the strongest point of Jorge as a rider, the side edge [grip]. You can say it's the same for everyone. I agree and Jorge also agrees. But as he said, 'this is my strong point. This is my style'. To compare, it would be like taking the engine-braking out of Marc's bike. You know what I mean? So we had to face the facts and the truth is that Jorge accepted what happened, but he didn't give up and at the end of last year he was already much fitter. He kept training this winter but also spent some time to rest and recover his energy levels. The previous year he'd taken so much out of himself. That is the big picture as I see it. It's not an excuse because finally the other guys were very good last year. They did very well. But they started the season very differently from Jorge. Of course we had other problems last year like the rain in Valencia [where Lorenzo made the wrong choice by pitting for his wet bike] but you also need to jump in his mind and think: 'There is nothing at stake. I'm not going to be world champion this year and I don't want to break my collarbone again and set everything back again for 2015'. So Jorge has now had a very strong winter. Resting, training and enjoying himself. That's also why I went over a couple of times. At Sepang 1 the bike improved and also we didn't have the same problems as last year with the heat-treated tyre. We've got used to that now and also they've [Bridgestone] adjusted the sidewalls [during last year, to provide more edge grip]. Yamaha has improved and I see these two tests as very positive for Jorge. 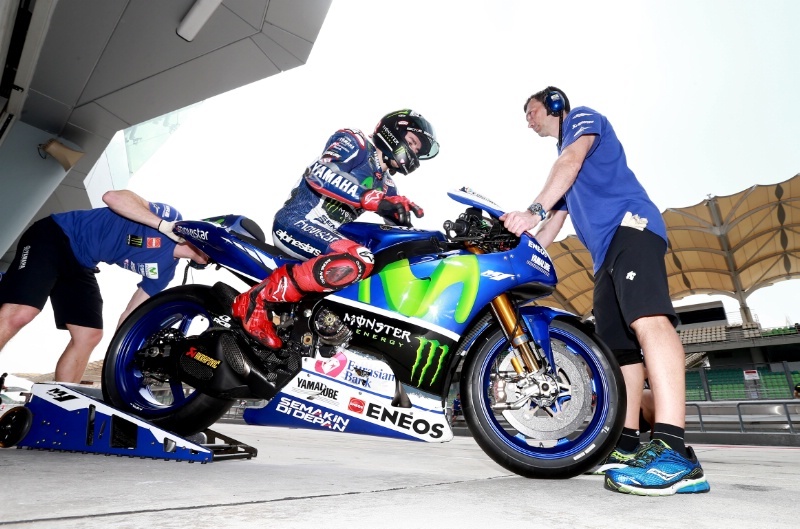 Lorenzo during 2015 testing at Sepang (Pic: Gold & Goose). Jorge is clearly looking better than last season, but how does it compare to other years? Is he as strong as before his title-winning seasons in 2010 and 2012 for example? This is very difficult to say because although last year was bad, for the reasons mentioned, the years before he had never been the strongest at this moment. This is also not our favourite track. He has never won here. But on the other side, Jorge has never been as fast here as this year. He did a 1m 59.4s. Yeah. The first test was better conditions. So for example Marc went one or two tenths slower this week. A '58.9. Almost the same as before, but anyway also Vale went a little bit slower than at the first test. So it means Jorge was good. He pushed. He tried hard and he's ready to go to Qatar and see how the package is working there. Speaking of the package, the big news for this second test was the debut of the new Yamaha gearbox, with seamless downshifts as well as upshifts. What does that change for the rider? The biggest advantage that we are searching for is stability under braking. You can imagine if the bike is always hovering around during deceleration, you struggle to stop it and also it is difficult to be consistent. One time the bike moves around in this way during braking, another time it moves in a different way. So when it is always moving the same you can improve the bike. When it is always moving differently it is difficult to find a way. Also we have the knowledge that the competitors are using it [seamless downshifts]. It takes development, but it looks like Yamaha have done a great job. It's helping in the way we wanted. 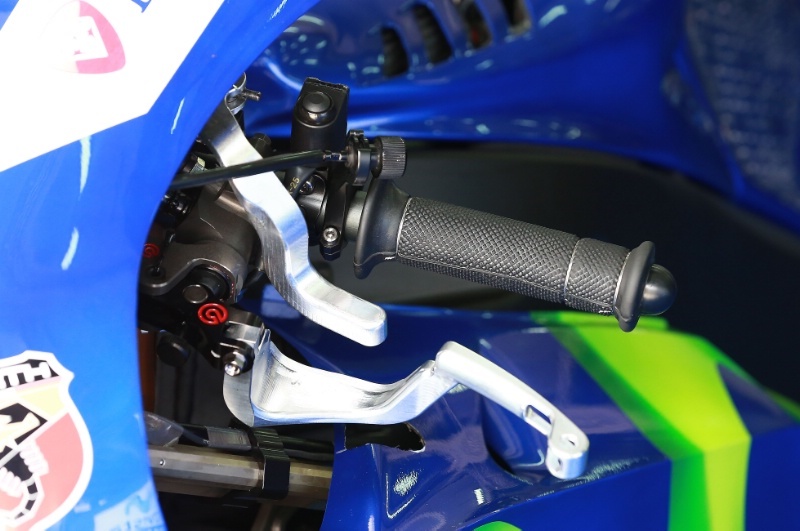 Lorenzo's handle-mounted rear brake lever at 2015 Sepang II test (Pic: Gold & Goose). Jorge also tried a handlebar-mounted rear brake lever which he said was related to his ankle injuries from 2008. How did that go? We tried a thumb brake last year and this year we tried a finger brake. There were two levers on the left side of the handlebar. The bigger one was the clutch lever, as normal, and the smaller one the rear brake lever. It's still difficult. The problem with both the thumb and finger brake is that because the riders hang off the bike so much now - using their body weight to control the bike, which you cannot change because this is the riding style - and because of the lean angles they have, they cannot press the brake with their hand. When their arm is across the tank. In the past the riders stayed more on the bike, so it was fine. So you won't use it for now? I don't see it happening. It was a good idea and it is interesting to try something new, but it's quite complicated. These bikes, as you can imagine, have a lot of performance and power in each gear. So they enter fast corners in second gear, but they also enter slow corners in second. So the bike behaviour is completely different. Sometimes you need a bit of rear brake to make the bike turn and if you could control it by hand that would be nice. But it is not easy. Zeelenberg trackside (Pic: Gold & Goose). Have you been trackside, watching as usual? Any changes between the relative performance of the Honda, Yamaha and Ducati? I saw the Ducati GP15. It looks quite ok. It seems to turn better. Consistency is maybe still a bit of a question mark. Difficult to judge that. But concentrating on our bike, I would say that we improved the package and also the riders are confirming that. So it's good news. 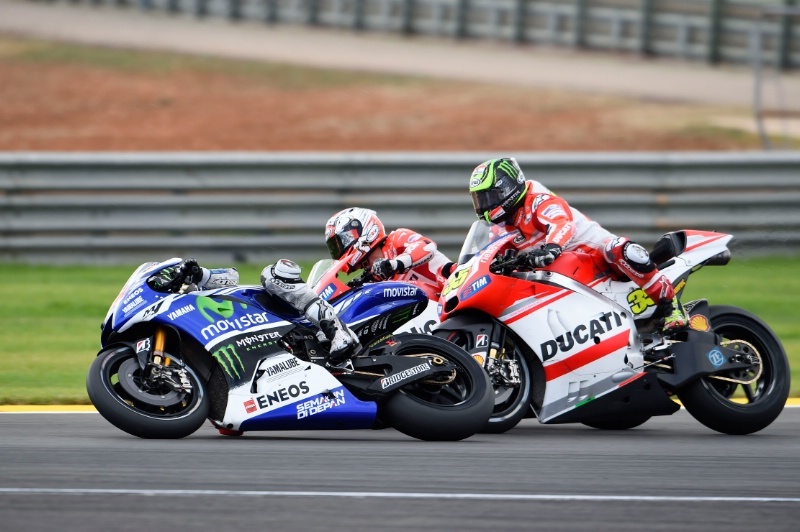 How closely matched are Jorge and Valentino at the moment? They are much closer than this time last year. Especially Jorge is enjoying the rear tyre much more than last year. That helps him to turn and control the bike. Also his consistency compared with last year is much better. He can do longer runs of five-six laps and do similar lap times. Last year he struggled with that and it is usually one of his strong points. One of his skills is that he can concentrate and be very precise - bam, bam, bam. He is maybe not directly faster than the rest, but over a couple of laps he can make the gap, make the difference. For Vale the first impression is that he is fit and motivated to attack the season. It's good to see from both riders. The circumstances at this test were a bit strange because it was so hot and if you look just at the best lap time it is a little bit... It is only a one-off lap, but more than that it's about if you want to take big risks. Vale is not a rider who wants to take a big risk here. At the wrong moment. The race in Qatar is what counts and we also know he is always stronger in the race than practice. Vale is riding very well, concentrating and still wants to improve. That's important. 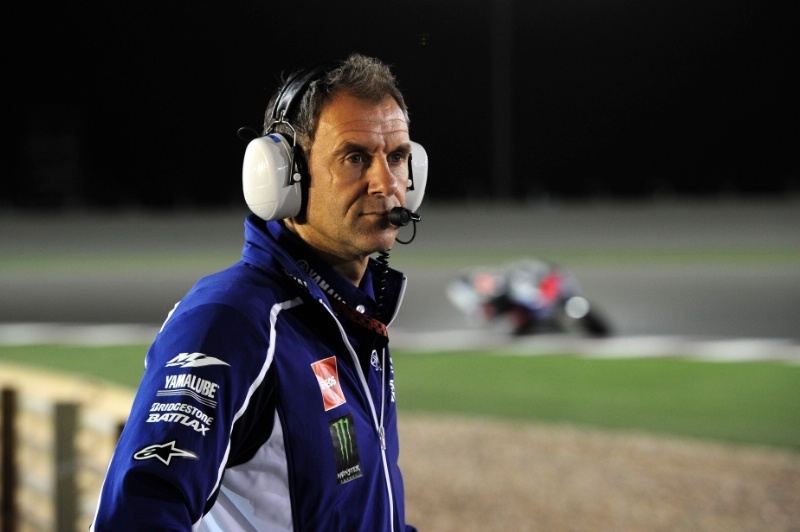 What is your plan for Jorge to take on Marc and Honda this year? Will the first few races be crucial to stop Marc building momentum in the way he did last season? That's of course true and it is on our wish list to do well at the beginning and not make mistakes. But it is a very long season. We have to be good everywhere, in all circumstances, during a very long and hard championships. So it's very difficult to plan it, but for sure you need a good start and don't lose 50 points in the first five races like we did last year. That doesn't help! Priority number one is to be always there and beat Marc at the races we are able to do so. 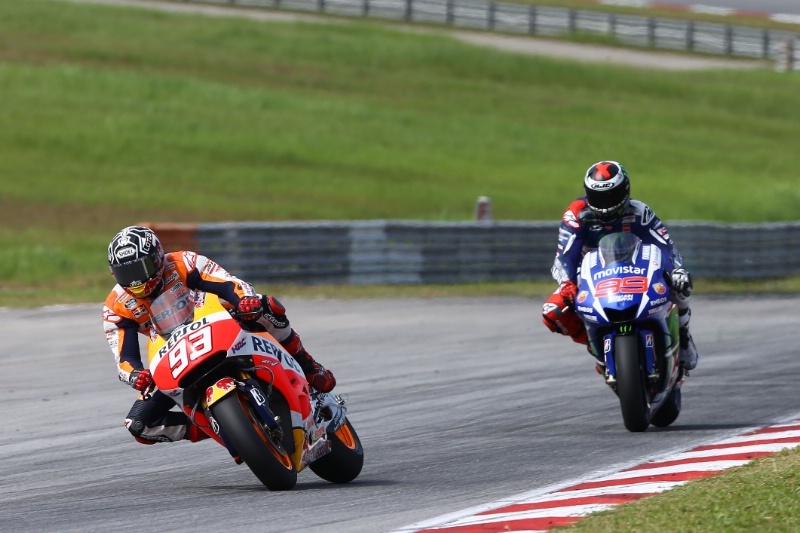 Marquez and Lorenzo, 2015 Sepang I test (Pic: Gold & Goose). Just looking at the Honda riders, what do you see as the main difference between Marquez and the others? His natural talent, feeling-wise and in controlling the bike over the limit, is so much better than the others. Yeah but also his natural, physical skills. He is like a gymnast. Even if he is under the bike he is able to get back on the bike. And he can still control the horsepower and performance without losing time. Because I have seen him making many mistakes, but he recovers from it. That is the difference to the other Honda guys. He understands as well that he can save many critical moments, when others would have been on the floor. He is not afraid. And I don't say the others are afraid, but he knows he can control it a bit better. So he takes more risks. You can see that on the track. Yes, but confidence with a reason. Because he knows when it goes wrong, 'I can still make it'. 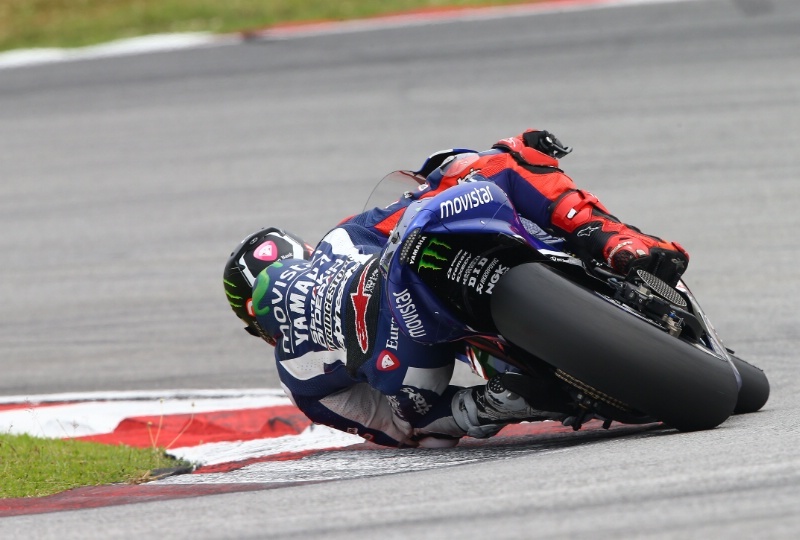 Lorenzo, Michelin tyre test, 2015 Sepang II test (Pic: Gold & Goose). Tyres obviously play a crucial role. I know you can't talk specifically about the Michelin tests, but in general terms what will the change of supplier mean for MotoGP in 2016? First of all it will be the same guys at the front. It's not going to turn MotoGP upside down. One manufacturer could have a little bit more benefit than the others, but at the moment it is difficult to say. Rider wise it could also be a benefit for one or the other, because riders all have different styles. Some ride more over the rear, some more on the front. So it could influence the results a bit, but the best guys will still be at the front. Electronics will also change significantly in 2016. Do you have any concerns about the move to a single ECU? Yes. A little bit. Because it is very important. I'm not concerned about if we will be able to control the bikes or in terms of the results, because everybody will learn how to use it, but more 'error' wise. 'We didn't see this one coming' - you know what I mean? The Japanese are very, very, very good at avoiding that. 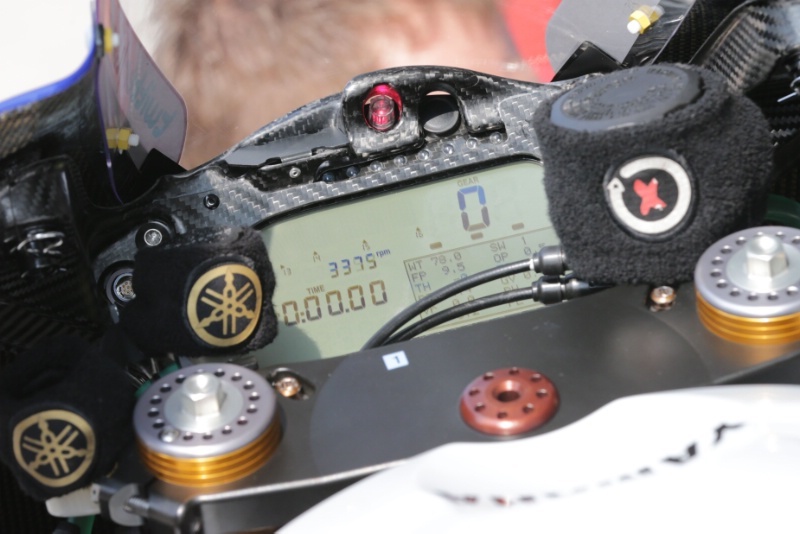 Lorenzo's Yamaha dash (Pic: Gold & Goose). How rare is it for you to get an 'error' with the present factory electronics? Can you give an example? Maybe one time in the last five years. When Jorge took a shortcut back to the pits half way around the lap in qualifying at Mugello  and then continued without stopping. The electronics didn't reset [so his position on the track as calculated by the electronics was wrong]. It happens because sometimes you have new strategies and systems and 'ah, we forgot about this'. But I have to say the electronics now are 'hufterproof' [foolproof] - a nice Dutch word! There is always safety for the riders now and I'm a little bit worried that for some manufacturer in 2016 the bike won't start on the grid for example. A bug like that. Now this kind of thing is controlled very closely. Then you get something that you have to prepare from scratch. And for me it's a pity that we cannot develop the electronics anymore, I have to say. It's more about the freedom to develop it ourselves. It's not like next year we won't be able to use traction control any more. There will be so much still and the riders need it. Because there is so much power available that you cannot ride these bikes without. Sure, some riders like a bit more than the others. Casey [Stoner] for example wanted to control the bike more himself than the electronics. Other riders like the bike to control more so they can concentrate on riding. You can choose. And if it goes really wrong there is something there. Now we are talking about this, I don't understand why MotoGP is going this way with the electronics. Because what I see in our company, what we learn from the MotoGP electronics, we really use in the R1. The R1 has the data and electronic system from the M1 basically. It has the six-axis giro and all the experience from here we use there. This will be gone because we will not create much more. You could not imagine ten years ago that what we are doing now you could control with the electronics: Lap-by-lap, corner-by-corner, shift-by-shift. We can adjust everything. But now we will not get 'bigger'. We are limiting the development of electronics to the areas we have now. There won't be any new thinking. Okay, six years ago it wasn't so interesting, one good rider and the rest were following. Now we have good riders, Suzuki and Aprilia are back, so do we still need this step? I don't know! I don't give the answers... I also think we've made good decisions, like fuel consumption, to go to 20 litres. But that's going to go back up! It's going to go back up, but we learned a lot from it as a company. In the past we were also able to use as many engines as we wanted. We didn't focus on that. Now only five engines are allowed and this improved the bike a lot. We can race for 3000 km with one engine and it doesn't lose performance. We needed a lot of development to create those engines, but now the cost is stable and the competition is close. The first 23 riders here [at Sepang 2] all set a lap time of 2m 1s or quicker. It was very tight. This is what counts for me in terms of a good championship and good competition. And not so interesting for you? Yeah. Because it becomes a bit more like single class rules. As they do in Moto2. Which I think everyone appreciates for Moto2. Because Moto2 is nice. But finally you want a battle between companies. When you see the fans they are for Yamaha, or for Honda. For some fans it doesn't matter who is on the bike because they support that company. This is what racing is about for me. Would you be in favour of open tyre competition in MotoGP? Look now. Many riders are making the jump from Superbike to MotoGP because they realise, 'f**k, I can do a good job. I have a chance'. It's close. If they were five-seconds a lap behind because the bike is not fast enough they are not coming. That is what happened in the past. They never came over because they would struggle to do well if they didn't have a factory bike and everything together. So I think the single tyre rule is good. It's hard to think of a better overall solution, let's say. Lorenzo, Dovizioso and Crutchlow, Valencia 2014 (Pic: Gold & Goose). Rossi has been critical of Ducati still having the Open class concessions this season - especially the softer tyre - what do you think about that? To be honest we should be very happy that they [Ducati] are still around because we need them here. But, yeah, to give them different restrictions than us is kind of not fair. Do you think it really makes much difference because the softer option tyre clearly helps in qualifying, but then Ducati don't have your hardest tyre available which might be the best for the race? Yeah but last year we hardly ever raced with our hard tyre. The hard tyre is slower than the medium. It is just more consistent. The softer one is faster but more difficult to keep alive for a race distance. So normally Ducati don't lose anything tyre-wise for the race because we all choose the same rear tyre: Our softer rear tyre is their harder tyre. That is from the riders' point of view, but also from manufacturer point of view we would never like to have that advantage. Because then you don't want to win. Can you imagine if we were allowed to have 2000cc engines next year? From a manufacturer point of view they [Ducati] struggled, so they got some benefits. But at a certain moment you also need to face the facts and say 'f**k, now it is time to get back to reality and know where are we'. Because we [Yamaha and Honda] are riding with 20 litres of fuel. They cannot finish a race if they have to do that. That's why the fuel limit is going up. They cannot reach, so we get some more fuel. So it will level out, but to help them again. Because we are okay with 20 litres at the moment. We have no problem. When we go to 22 litres maybe we can develop in other areas. Maybe you can increase the performance because you have more fuel to burn. But I don't think it will cost us a lot more money because I think many of the changes [to optimise the extra two litres] can be made by the electronics. But for sure, it's a help for them to go to 22 litres instead of 20. 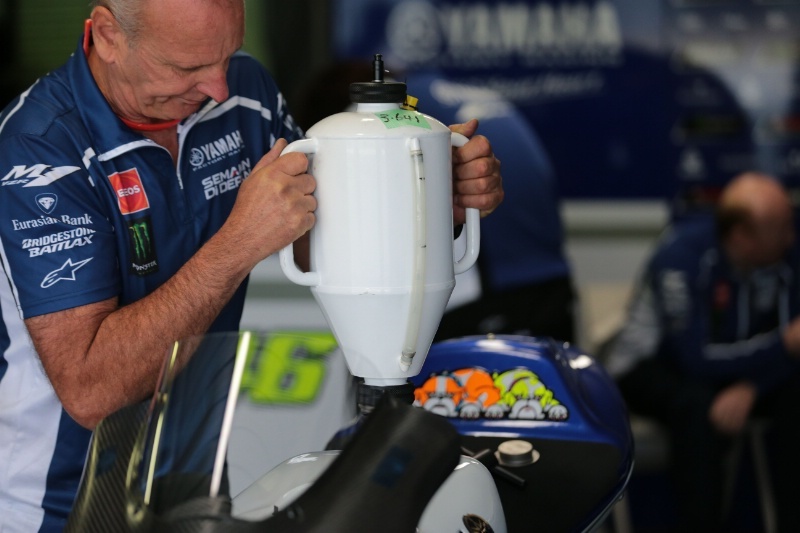 Putting fuel in Rossi's Yamaha (Pic: Gold & Goose). Yes. This is the reality. And of course the organisation know that. Can you imagine if the rules had been only 18 or 19 litres for 2016? They [Ducati] have other issues to fix to be competitive without having to save fuel as well. And for Suzuki it is the same. They burn a lot of fuel and you cannot change that in one year. So you compensate a lot for them. Yamaha and Honda agreed to do that, for the final decision. How difficult was it to adapt to 20 litres? At first it was a lot of work but there was a plan behind it and we learned a lot by development. Both manufacturers [Honda and Yamaha] probably thought they had an advantage and could manage so it stayed at 20 litres. Finally the good riders are all still together and the only disadvantage is that the other manufacturers cannot keep up. Yes. At this moment the M1 is using less fuel than the R1. Really. It's less consumption than the R1... I better stop now! Lorenzo and Yamaha management, including Zeelenberg (right), celebrate 2010 MotoGP title (Pic: Gold & Goose).